Finley Fryer was born August 18, 1952 in Santa Monica, California. 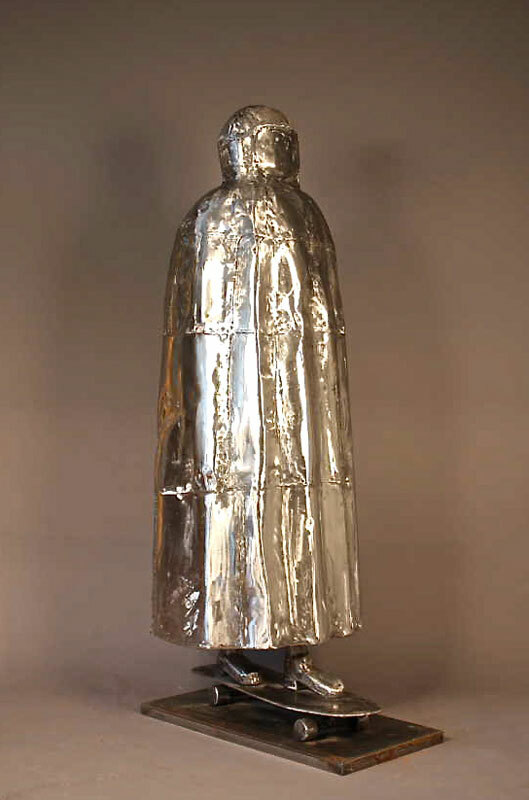 This steel sculpture, Burka Boarder, was finished in 2010 by Finley Fryer who studied at UC Davis in the early 70’s with Roy Deforest, Manuel Neri, WiIliam T. Willey, Robert Arneson, Wayne Thiebaud and Robert Frank. The sculpture depicts a simplified form of a female figure cloaked from head to toe, standing on top of a skateboard. She wears a mask that somewhat resembles that of a welder’s. The seams that can be seen throughout the piece are hints left behind by the artist, to show how the work was made. He began making metal armature for other sculptures and he found his love for the metal medium. The sculpture has been adopted by the city of Davis and sits in front of Wells Fargo.